Tourists from China look at a souvenir photograph taken outside the Grand Palace in Bangkok, Thailand, on June 28, 2014. 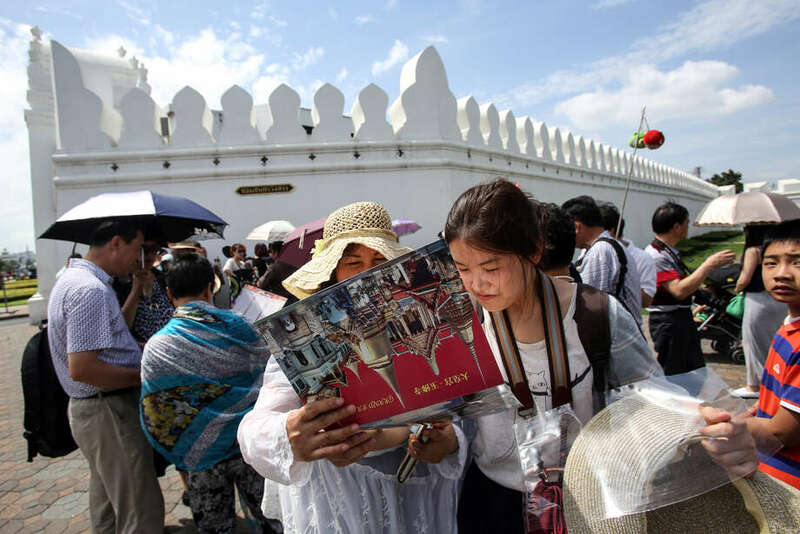 Tourists from China look at a souvenir photograph taken outside the Grand Palace in Bangkok, Thailand, on June 28, 2014. "The negative growth in Chinese arrivals is a downside risk in the second half of 2018," said Kampon Adireksombat, the chief economist at Kasikorn Securities in Bangkok. The tourism slowdown and the impact of global trade disputes will c ut Thai economic growth to 4.2 percent next year from an estimated 4.5 percent in 2018, he said. The Thai military government has moved to limit the damage from the video of the attack on the Chinese tourist, saying on Twitter that Prime Minister Prayuth Chan-Ocha regrets the incident -- underlining the administration's sensitivity to bad press on the mainland. The tourism sector has a history of bouncing back from setbacks. The Bank of Thailand expects arrivals to improve and anticipates over 38 million visitors this year -- equivalent to more than half the Thai population. Other government figures estimate that Chinese travelers contribute close to a third of 2.09 trillion baht ($65 billion) in foreign tourism revenue. The recovery may take longer this time around because so many Chinese died in th e boat accident, Kampon said. "There used to be seven to 12 charter flights per day from China to Krabi," said the council's President Ittirith Kinglake. "Now it's down to three flights per day with some having two to three people on board." For all the challenges, overall arrivals continue to expand: Bangkok is the world's most visited city, and the beach resorts of Krabi and Phuket lure travelers from all over the world. Indeed, the environmental impact of the sheer number of tourists can also be a problem. For instance, Thailand on Tuesday indefinitely shut Maya Bay on Phi Phi Island, which was made famous by the year 2000 movie "The Beach" starring Leonardo DiCaprio. "Otherwise, we could lose Chinese visitors to other countries," said Vichit. "If we can fix this soon, Thailand can recover."